This page is under construction and further information will be added as materials are developed. 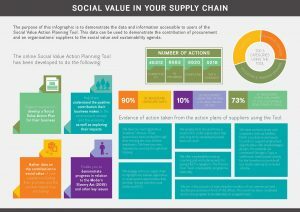 This action planning tool enables all of your suppliers to develop an action plan in line with your organisational social value objectives. The Tool allows you to support all of your suppliers to go beyond a minimum commitment to social value and provides them with a customised action plan, which can be monitored and measured. As the Tool provider you are able to interrogate the data provided via supplier action plans to help plan your engagement activities on social value, gather evidence of good practice, link to your organisational strategy and use the action plan developed to provide a clear and measurable focus for contract management discussions. Although the tool has been designed to support suppliers with their own sustainability journey, the data it produces, simply as a by-product of their engagement is hugely valuable to procurement and sustainability professionals. The data is presented via an online dashboard, in real time, allowing you to easily interrogate the data that relates to your suppliers. Tool providers can take advantage of some free tool-related training via a bespoke webinar. The webinar can be held at a date and time to suit yourselves and can involve as many of your team members as you would like to include. 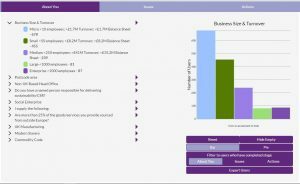 It can also be tailored to your individual needs in terms of training in relation to either getting the most from the the tool and/or extracting data from the dashboard. Email Sandra (admin@netpositivefutures.co.uk) to book a webinar.